The clean, classic lines of our Colonial or Ranch panel styles will add instant charm and curb-appeal to your home. Authentic woodgrain texture embossed on the panels has the look of wood but the strength of steel. Add decorative insert windows and choose one of three classic colors to find the perfect look at the perfect price. * Not all window styles are available in all door sizes. See dealer for details. We make beautiful garage doors. We also care that what’s behind them will keep your door worry and maintenance-free for years to come. Learn more about the door’s features. Door sections are constructed from high-strength, rust-resistant galvanized steel and coated with a baked-on polyester paint finish. Which means your door will last a really, really long time. 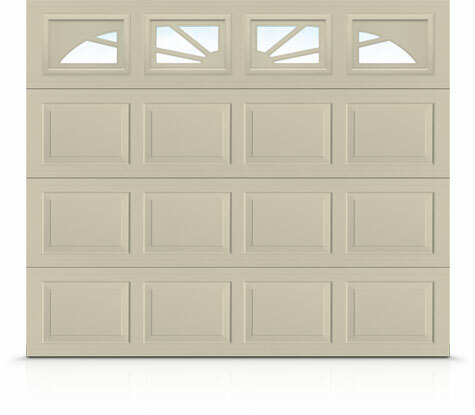 There are enough worries in life – your garage door shouldn’t be one of them. When you choose Richards-Wilcox, you’ve chosen the best garage door you can buy and we’ll back that up in writing with our LifeTimer™ Basic warranty. Rust-through: as long as you own your home. Hardware/springs: 1 years. See warranty for complete terms and conditions.